Dealer peaks at all cards valued with 10 points and all aces. If he has a natural hand, the game is immediately stopped. Okay, that’s close enough with everything that could be referred to as ”standard” in this type. The more I play it, the more I start to see similarities with Pontoon, which actually is an unlicensed game variation of the Spanish 21. Back to the things that are not quite the same, as you might think. 8 Spanish decks of cards are used – 48 cards in every deck. All common cards are there, except for the 10s. Players BlackJack beats dealers BJ, same applies to 21. All other pushes work per standards – it’s a push. You can double down on any hand combination and re-double down once. Double down after split – including when holding aces. Surrender after doubling down is available. Okay, so as you might feel, there is a whole lot of different aspects to this game. However, to me it seems like the majority of these rules would actually improve the gameplay and bring more action to the already packed game. That’s not it either, there also are bonus payouts awarded based on various hand combinations. Note that no bonus wager is required. Note that these payouts do not apply after doubling down or splitting. You can play Spanish 21 at any MicroGaming powered casino, which also includes two of my personal favourites – Royal Vegas and Jackpot City. Royal Vegas Casino is the first of two and was launched back in 2000. Owned and operated by the reputable Fortune Lounge group of casinos, I would easily place it in a list of top 10 most trusted casinos. 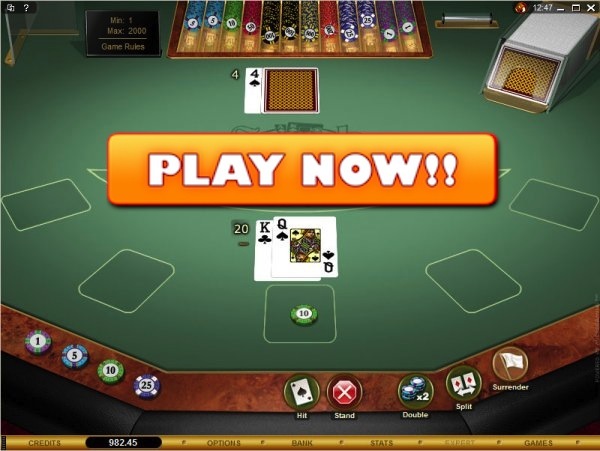 Choose from over 25 BlackJack Game Types that are offered and play this game in either an instant flash, downloadable or mobile casino client. Join now and you will also receive a welcome bonus package – $1,200 in free bonus money matching your first 3 deposits! $1,200 In Welcome Bonus – Join Now! Jackpot City Casino is even older than the previous one – established in 1998 and will celebrate its 15th birthday this year! Also powered by MicroGaming, this brand stands out by their design, flexibility and multi-lingual support. As a new player, you can claim up to $500 free on your first two deposits! This goes on top of any other promotions ran by JPC, of course! $500 Free on 2 deposits – Join Now!